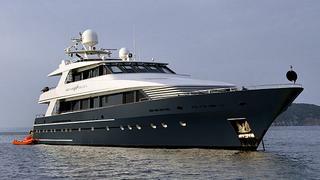 News just in from Moran Yacht & Ship of a €1 million price drop on the 34.8m motor yacht Miami Blues. She was built by Euroship in 1991 to Lloyds class in steel and aluminium with exterior styling by Richard Hein of the A Group. Refitted in 2007, Miami Blues accommodates 12 guests in a master suite, VIP stateroom a double and triple cabin and a Pullman berth. while twin 1000hp Caterpillar engines give her a cruising speed of 11 knots. Lying In Istanbul, Turkey, Miami Blues is down from €4.5 million to €3.5 million.